Okay, so Where would some of us be without spell check? The sometimes annoying, but frankly indispensable computer aid has spared billions of typographical blushes..you doubt ? 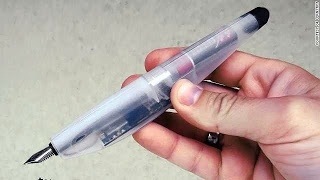 Lernstift (German for “learning pen” is a digital pen with a difference, carrying not only ink inside its casing but also a tiny computer that alerts users to spelling errors.